Vanessa: Yesterday was a Monday unlike ever before! 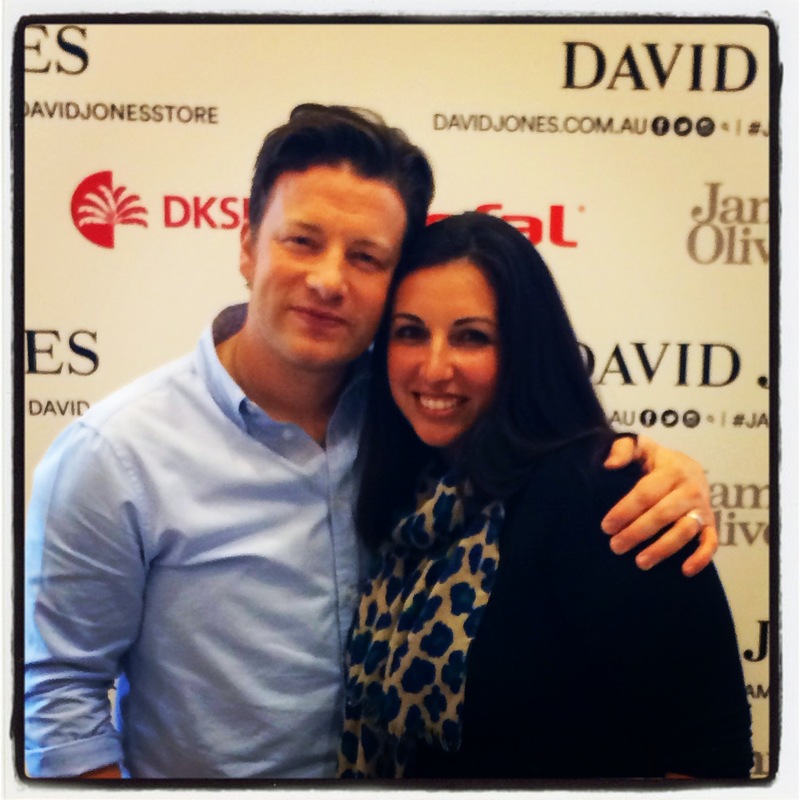 The reason being my fiancé and I were fortunate to have been able to meet and have lunch with one of our culinary idols..Mr Jamie Oliver! There were more photos taken of the man himself rather than the food we dined on but none the less I thought this was an experience worth sharing! When we got invited to attend the lunch, my fiancé and I were both very excited being such “Jamie fans”. As the hour drew closer , I found myself feeling somewhat nervous and increasingly concerned about what questions to ask Jamie. 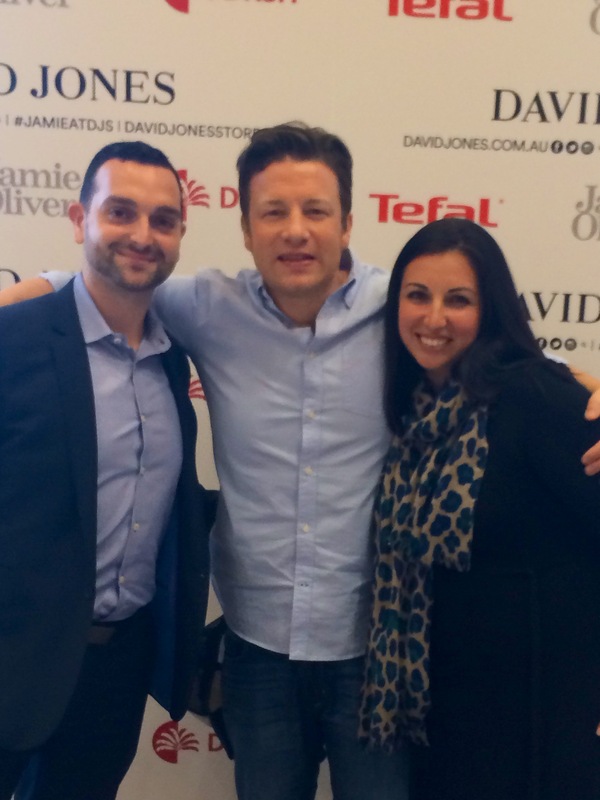 As many of his fans will know, Jamie draws much of his inspiration for his cooking from Italy, having being mentored by Italian chefs such as Antonio Carluccio and Genaro Contaldo. I thought this would be a great link for me with the Italian background and all and I firmly fixed one question in my head to ask him..” what is your favourite place in Italy?” Seems like a simple, straightforward question..well not when you suddenly become star struck by the man you have spent many hours watching and learning from on TV.. as it goes! 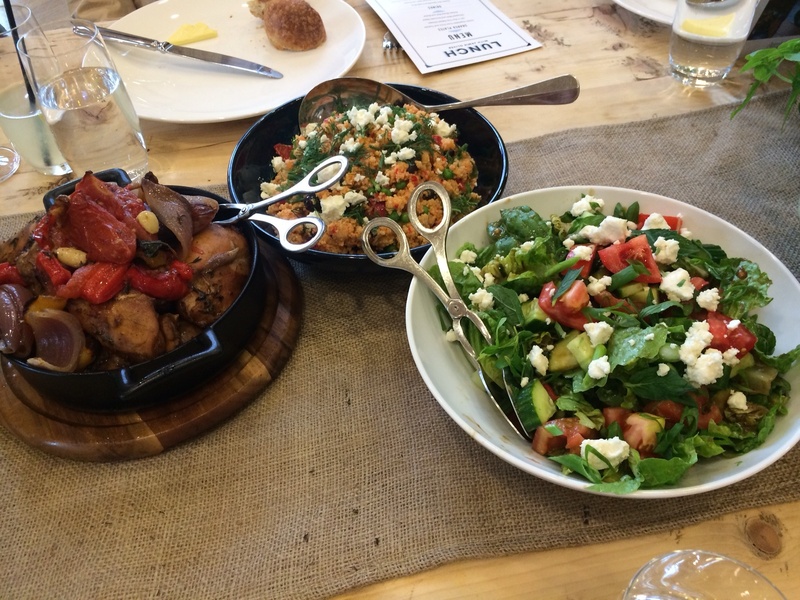 When we arrived at David Jones’s city store, we were greeted and encouraged to take a seat at one of the dining tables which had been set with lovely pots of fresh herbs..some of Jamie’s favourites! It was a very intimate dining experience with only five tables of ten, and a spare spot on each table for Jamie to float between. We dined on some recipes from Jamie’s new book Save with Jamie, which included ‘Hit ‘n’ Run’ tray baked chicken, herby vegetable cous cous and chopped mint and avocado salad. 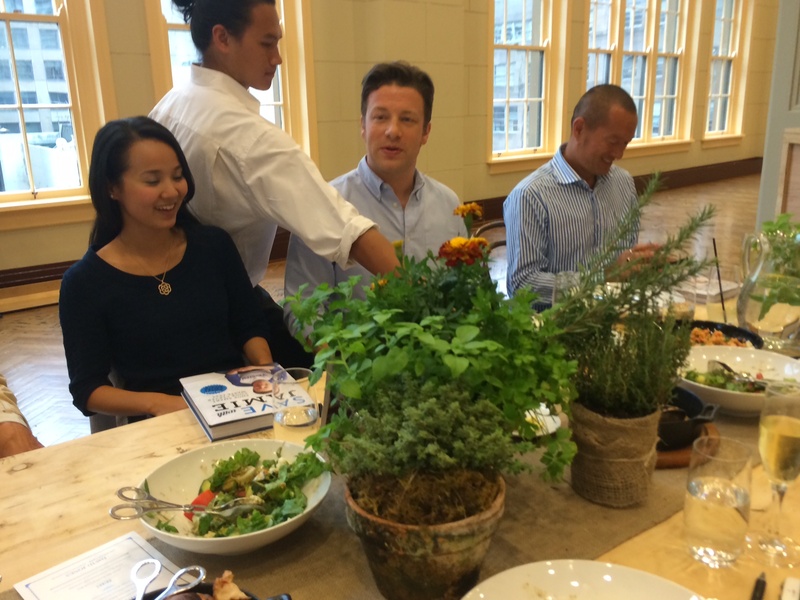 Although the nerves were still present, I managed to sample each of the dishes which were light, fresh and aromatic. The food went down perfectly with a glass of bubbly! When Jamie approached our table, he was charming, relaxed and very friendly. He shook each of our hands and sat down for a casual chat with us. He talked about his restaurants in Australia, his inspiration for cooking and his view that children should be actively encourage to participate in the kitchen. I sat attentively and listened..waiting for the moment I could ask my pre-planned question. Unfortunately the moment did not come…not then anyway! Once we had finished our lunch we each had the opportunity for a book signing and a photo. It was wonderful to see Jamie interacting so comfortably with each of the guests and his patience was evident as he gladly smiled for endless photo opportunities. Finally, it was my turn to meet him and of course have my photo (or two) taken with him. I took the opportunity to ask him my question and he engaged me in some friendly banter. The answer to my question was either Tuscany or Amalfi Coast…athough he did add “it’s all beautiful”. Very true indeed Mr Oliver! All in all it was an unforgettable day and we left feeling very inspired after meeting such an icon of the culinary world.